The Chinese characters mean "Gold - Sparrow - Twig", or "Gold - Sparrow - Flower". They are very unusual and did not show in my Japanese wordprocessor. The plant originates in Southern Europe and was introduced to Japan around 1670 by the merchands from Holland. The long green branches hang down like a bend bow and start flowering around May. The plant belongs to the family of beans, and the yellow or brownish-yellow flowers hang thickly on the branches. They are often used for hedges. We also planted some around the home, but they did not last the many rainy season and the many storms of last year made an end of them. 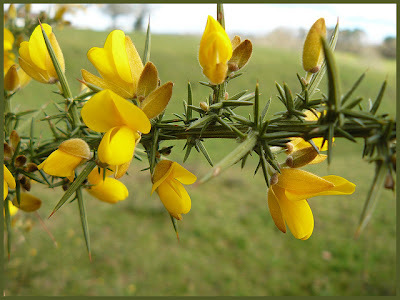 By the way, the English FURZE reminds me of the German word for "I am farting", so I choose GORSE as main name. The plant in German is called GINSTER. Reading the below text from an English explanation, I think the Japanese use of the GOLD is also explained very nicely. Furze, also known as gorse or whin, is a perennial evergreen shrub belonging to the pea family. It forms a much branched, stunted shrub usually no taller than six feet high. The leaves are very small and in older plants they form into long needle-like thorns. It is found in rough pastures, heaths and rocky places, preferring a dry soil. The word furze is derived from the Anglo-Saxon name fyrs, and gorse from the Anglo Saxon gorst, which means ‘a waste’ this being a reference to the open moorlands where it is often found. The plant’s thorns, and its dense habit, makes furze an excellent hedging plant. It can also be used as a barrier to protect young tree seedlings in coppices and as cover for game birds. Chopped up branches were placed in vegetable beds to keep mice and birds off newly planted crops. Pliny, who first named the plant Ulex, stated that the branches were placed in streams to collect gold dust from the water. When dried and burned, the gold could be collected as tiny nuggets from the ash. The thorny nature of the plant means that it is often viewed as having protective powers. In Wales it was said to guard against witches. As well as it’s use as a hedging material, furze was traditionally gathered into faggots and used as tinder to start fires. In 1864 it was cultivated in Surrey and other English counties especially for this purpose, being popular with bakers to whom it was sold as fuel for their ovens. It has a high concentration of oil in its leaves and branches, and so catches fire easily and burns well, giving off a heat almost equal to that of charcoal. Because older plants can carry a lot of dead wood, furze can be a hazard in hot, dry summers. The ashes have a high alkali content and can be mixed with animal fat to produce soap, or clay, to form a soap substitute. They were also spread onto the fields to improve the soil. Furze can also be used as fodder for animals. It was said that an acre of furze could provide enough winter feed for six horses. It has half the protein content of oats. Horses and goats can strip the leaves and eat them straight from the plant, but it was usual practice to run the branches through stone mills or hit them with wooden mallets. This crushed the thorns and reduced the wood to a moss like consistency, which made it more palatable, especially to cows and sheep. The bushes were often deliberately burnt down in order to encourage new growth, the fresh sprouts of furze and grass providing easily accessible food for stock. The bark and flowers produce a fine yellow dye. In Eire the flowers were also used to flavour and add colour to whiskey and the Danes were reputed to use them to make beer. They can also be used to make wine and tea. Flower buds, collected and potted with a blade of mace and some peppercorns, in a white wine vinegar and salt solution, make a fine pickle. Culpepper states in his herbal, that furze was good to open obstructions of the liver and spleen. In homeopathy furze is used to help people who have given up hope, who have no faith in the future. It puts people in touch with their own inner resources and helps them move forward by releasing courage and determination. In the Scottish highlands holly and gorse were sacred trees of the Cailleach Bheur, a blue hag, who was associated with winter and the protection of animals during the season. She was reborn every All Hallows Eve and brought back the winter weather with her magical staff, which froze the ground with every tap. On Beltane Eve she returned to the Earth, throwing her staff beneath a gorse bush before turning to stone. As one of the sacred trees, furze was included in the Celtic Beltane bonfires. The stock would be herded between these for purification and protection before being released onto the summer grazing. When this tradition diminished, torches of furze were still carried around the herds and farm buildings in order to cleanse the air and protect the animals against sterility. Furze is closely associated with the sun god Lugh, the Celtic god of light and genius and with the Spring Equinox, at which time it’s one of the only plants in full flower. However folklore attaches it to festivals throughout the spring and summer months as a symbol of the power of the sun. In Brittany the Celtic festival of Lugnasdagh, on August 1st, is known as The Festival of Golden Gorse. As an evergreen that flowers the whole year round, furze is seen to carry within it a spark of the sun’s life giving energy, a spark that can be seen even through the darker winter months. It is a symbol of encouragement and a promise of good things to come. Furze tells us to remain focused and optimistic, even in the darkest days. To keep hopeful and remain constant throughout the inevitable periods of difficulty we all experience. As one of the first Spring flowering plants, the furze provides a plentiful supply of pollen for bees when they first come out of hibernation. The product of the bees labour, honey, is the Celtic symbol of wisdom, achieved through hard work and dedication. The furze tells us that if we apply ourselves and keep faith in the future, we will be rewarded. However bleak things may appear, there is always the possibility of periods of fertility, creativity and well being. Whilst its thorns remind us that there is protection from unwanted ideas or influences. Gorse is an excellent kigo in Ireland for late winter / early spring. Its conspicuous yellow flowers and pervading presence on less fertile, stony soils, means that it is part of rural awareness throughout the country. Its heavy scent brings a whiff of summer into the cold season, reminding one of tropical greenhouses. A page of the Flower Park in Shinjuku, in the middle of Tokyo, where many flowers are raised. They list a "Princess Gorse" Hime Enishida, which flowers from April to May. in the limits of Harmony. Its also commonly called 'furze' and 'whin' (the latter in the North of Ireland moreso). Its 'aiteann' in the Irish Gaelic.